Joe Concha. The Hill. Fri, 19 Apr 2019 17:22:38 +0000. Morocco's Abderrazak Hamdallah breaks the scoring record in Saudi Arabia to equal the feat of Algeria's Baghdad Bounedjah in the Qatari league. BBC News. Fri, 19 Apr 2019 13:21:47 GMT. Al Jazeera. Thu, 18 Apr 2019 10:41:04 GMT. Canadian Broadcasting Corporation. Wed, 17 Apr 2019 14:48:06 EDT. Hollie Mckay. Fox News. Wed, 17 Apr 2019 15:39:15 GMT. Reuters. Wed, 17 Apr 2019 11:03:59 -0400. Straits Times. Tue, 16 Apr 2019 05:00:00 +0800. Anthony Cuthbertson. The Independent. Mon, 15 Apr 2019 09:59:00 GMT. The group of 900 suspects were handed over to Iraqi authorities by the US-backed Syrian Democratic Forces, which ousted ISIS from swathes of eastern Syria including territory bordering Iraq. Daily Mail. Sun, 14 Apr 2019 22:45:38 +0100. Yahoo. Fri, 12 Apr 2019 13:53:43 -0400. This question has been a source of debate since the group published hundreds of thousands of U.S. military documents and diplomatic cables in 2010, many related to U.S. wars in Iraq and Afghanistan. Greg Myre. NPR. Fri, 12 Apr 2019 13:21:00 -0400. Jennifer Jacob, Bangalore. Janes 360. Wed, 10 Apr 2019 00:00:00 GMT. ABC News. Tue, 09 Apr 2019 10:10:24 -0400. Algeria striker Baghdad Bounedjah's 39 league goals help Al Sadd to win Qatari title with a match to spare. BBC News. Fri, 05 Apr 2019 08:27:58 GMT. The Local. Fri, 05 Apr 2019 10:08:06 +0200. 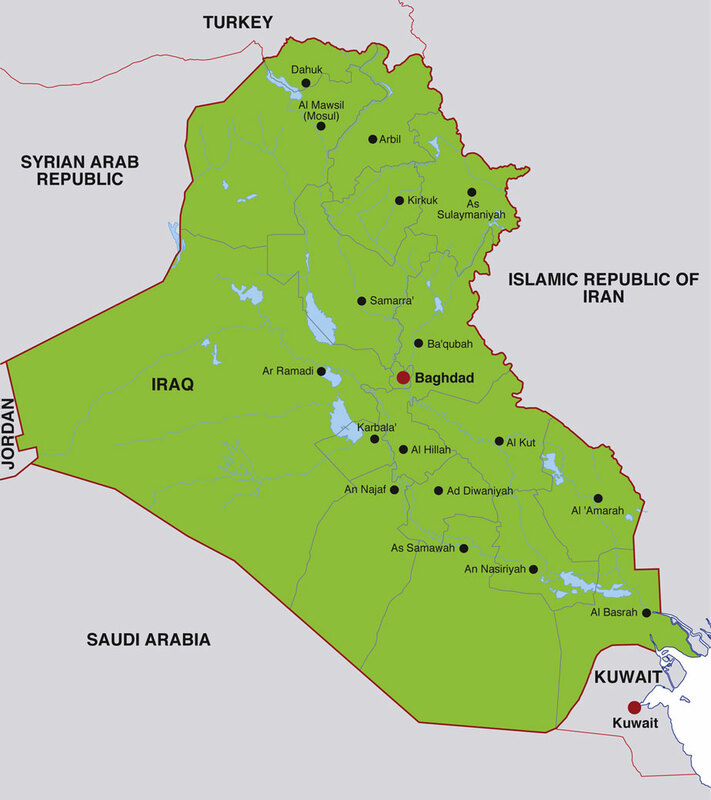 The Republic of Iraq, located in southwest Asia, is governed by a federal government comprised of executive, legislative, and judicial branches plus various independent commissions. Its capital city is Baghdad, and its currency is the Iraqi Dinar. The primary languages used in Iraq are Arabic and Kurdish, and in 2007, Iraq's estimated population was 27,500,000. Approximately 77% of Iraqis are Arab, 18% are Kurdish, and 5% are other ethnicities. Click on the small Iraq map shown at right to display a full-size map of Iraq.